Biochemical analysis is a rapidly expanding field and is a key component of modern drug discovery and research. Methods of Biochemical Analysis provides a periodic and authoritative review of the latest achievements in biochemical analysis. 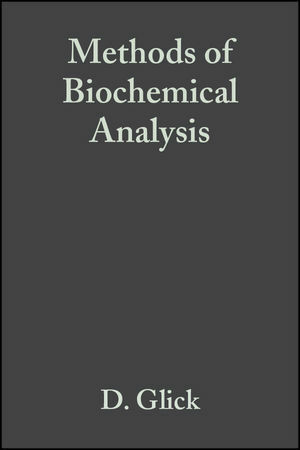 Founded in 1954 by Professor David Glick, Methods of Biochemical Analysis provides a timely review of the latest developments in the field. Dr. David Glick was born in Homestead, PA, in 1908. He received a B.S. degree and a Ph.D. in chemistry from the University of Pittsburgh, and the Honorary LL.D., University of Glasgow, was conferred in 1980. He was Hernsheim Fellow, New York Mount Sinai Hospital, and subsequently held Rockefeller Foundation and Commonwealth Fund fellowships at the Carlsberg Laboratory, Copenhagen; Stazione Zoologica, Naples; and Karolinska Institutet, Stockholm.